Public vs. Private – Should Student Work Be Public On the Web? 10+ years ago, filters and blocking tools were banning access to most blogs and web publishing services in schools around the world. In fact, this is exactly why The Edublog Awards were started – to showcase the excellent work being done with blogging in schools – hoping it would begin to break down these barriers and change the minds of nervous administrators and teachers. Perhaps it worked! We’ve made significant progress since, as services like Edublogs are hardly ever blocked in schools now. And the use of blogs in education for many is integral to lessons and student learning. Should students be allowed to publish school work publicly on the web? We get asked this question constantly. School administrators, who are rightfully risk-adverse, often immediately say that no public posting is allowed. By decree, access to any student work must be limited to only those approved and with passwords. Teachers, afraid of potential headaches due to students saying something inappropriate, bullying, or not having total control also get nervous about allowing students to publish freely online. And, I’m very mindful of the fact that the privacy feature built into Edublogs is one of the number one reasons why schools choose our service. My answer to the privacy question isn’t really good for business. But, when you look at all the benefits that publishing to the web can bring to student learning, the answer is most definitely yes. No matter the age or experience, we believe that blogs are meant to be public. There are often legitimate fears and concerns around students posting publicly to the web. But with proper guidance, monitoring, and common sense classroom management, the benefits always outweigh potential negatives. Here are some tips. From the beginning, be upfront with students that the work is public. Let them know that their parents, other teachers, fellow students, administrators, community members, and anyone can and will visit. Have students articulate what this means for the quality of work expected. You should have ongoing discussions about being smart on the web. Include things like not using full names, no photographs with names, not sharing personal contact information, and not posting any personal stories that you wouldn’t want people to know 10 years in the future. There are some sample guidelines as a place to start here. If needed, get parent permission. This will depend on the local policies and procedures in your school. Vicki Davis shares 18 excellent examples on how to secure parent permission here. There’s nothing less motivating than publishing a post and not having anyone read it. Make leaving comments part of student assignments. Use twitter (hashtag #comments4kids) to get readers from around the world visiting student posts. Leave comments yourself. The discussions that happen at the end of posts in comments are ripe for learning opportunities. Allow students to personalize their blogs with photos, themes, and colors. Let students write posts about their interests or hobbies, share their favorite videos, and more on their school blog. They need to know that they own the blog so that they take pride in it. In traditional LMSs, Edmodo, and most ePortfolio systems, everybody’s space looks the same. The ability of blogs to be personalized and unique add to the ownership and excitement, which can increase the quality and creativity of work. It may not be the students you are nervous about, but more the potential interaction with the general public. This is a fair concern, and there are things you can do to allow public viewing but not allow public comments. For example, go to Settings > Reading and choose to block search engines. This way, only those that have been given the direct link to the student blog will ever be able to find it. Random visitors won’t come from Google or other means. Also, go to Settings > Discussion and choosing “Users must be registered and logged in to comment”. This way, not just anyone can leave a comment. On Edublogs Campus networks, these settings can be chosen and mandated network wide for all students at the school or district level. While we do have moderation tools built in (so teachers must first approve posts before they are live), have the goal be that students can freely publish at will. You can monitor after the fact, but busy teachers will have a difficult time keeping up if blogs are used regularly. Many teachers will start out approving the first few posts and then once students show they can handle it, give up the control. Of the hundreds of thousands of student blogs we host on Edublogs.org, currently only around 40% are public. This tells us that for the majority of you that already know the benefits of blogging, you still choose to keep things private. What barriers or fears are keeping you back? 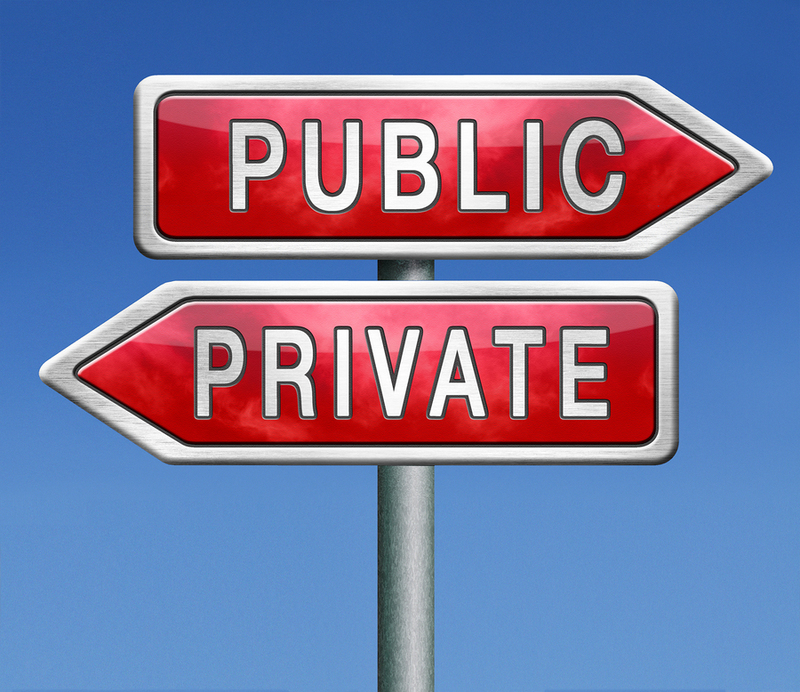 Student work should absolutely be public if the student wants his/hers work to be seen publicly or private if they don’t want their work to be public. It should ultimately be their choice but they should be told the benefits that this blog outlines of posting public. If a student posts their work publicly then they have the benefits of hearing feedback from someone other than their teacher, it will help them understand more about the topic and generally improve their work. If it is posted privately, the student would only be getting feedback from the teacher and those allowed access which could make it harder for them to improve their work. Given the right community of readers student work can be helpful when put online. It is refreshing for parents to see what is going on as well. However, the internet is the biggest catch 22. There are great arguments to each side. I think it depends on whether the posting is being done by the student or the teacher, and whether it’s a required part of the class work. If it’s required, then the school should also be required to (give the student the option to) remove the material at the end of the course. I do not agree. Blogging is a great tool, but this article completely ignores the permanence issue. Try to imagine that every stammering oral presentation, every 5th grade writing sample and every stick finger drawing you ever made in a classroom was permanently posted online, forever. As a teacher how would you feel if your class of iPad toting students were surfing through your complete “virtual portfolio” while you were trying to assign them an essay? If you were a doctor would you want that 10th grade blog discussion about euthanasia coming up in Google searches of your name? Should we be able to read our mailman’s 4th grade haiku comments or watch a video of our dental hygienist demonstrating pull-ups in as a middle school gym student? Mentor/mentee, coach/athlete, teacher/student – the whole learning process – these are complex and necessarily private, personal and temporary relationships and something very important is lost when we forget that. Blogging is great but this new information era needs educators who fully appreciate the long term consequences of posting everything publicly. I’m not seeing much reflection on that here. Rightly said. There’s already lots of NOISE around. Let us not be over-enthusiastic! [ Smiles ] I am okay with the idea of students posting their work online provided that their work is copyrighted. Blogs can be used for a myriad of things, but the most powerful is to create conversations among people that don’t share a local community. While closing blogs is acceptable, it will not help the students reach beyond the local community. The real power is in conversations created with those whom the student otherwise would not have contact with. I have been blogging with my middle school students for several years and have had public blogs. When we start, I emphasize the public nature of blogs and how I plan to share them with teachers, administrators, and parents. I give my students three guidelines to follow with their posts: Make yourself look good; make our class look good; make our school look good. On several occasions I have had the authors of the books my students read and review drop by to leave comments on their blogs. That makes for an exciting day! I absolutely agree. As a middle school teacher for many years, my experience is that most of our students were posting something online anyway – to various social networking sites – without any supervision. This is their world and if they are not accessing guidance through school, they may never get it around their digital citizenship. All your points about the pros, I heartily agree with! At Korea International School, we have students in the secondary open to the public, but we do turn off search engines and have comment moderation turned on. In the elementary school, we have the students set up to only be viewable by members of the blog. Our parents have been very supportive of the entire experience.